My favourite character in this book is Safiya. She is artistic. After looking at colourful pages from magazines, Safiya decides to put them up on the wall outside of her home so everyone walking by can see and admire her collage. The mural is a story, a story of her life. I feel bad for Safiya because she lives a hard life. Her mother and father have both died. Her Grandma, Cucu is sick. If Cucu dies, Safiya will have no one for all they have is each other, a board game called mancala and a bracelet that Saffy’s mother made. I think it would be fun to be friends with Safiya because she seems like a really kind and gentle person. 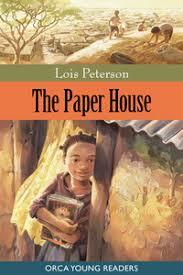 I liked this story because it is set in another country. It is interesting to know about other people’s lives all over the world. This book is set in Nairobi. Cucu is sick with a bad cough so Saffy searches to find things that she could sell. She looks in the big mountain of garbage. Many other villagers are poor and look there so they can eat too. Once Safiya found a clock at the dump that was still working. They ate well throughout that week. Another reason I liked this book is because Lois Peterson is a great author. She describes everything so well that it makes you feel like you were really there watching what was going on. One of my favourite parts in the story is when Saffy comes home to a house on fire. I loved this part because it was very sad and thrilling. “Cucu! My Cucu…” I cried during this part because it was suspenseful and scary! I think that anybody would love this book, young and old. My mother read it and she loved it. I suggest for ages nine and up however, just because it was pretty sad at certain parts. Review by Nora, age 11, grade 6. This review is from Canadian Teacher Magazine’s Jan/Feb 2013 issue.